Minuteman Press is your local business marketing service provider. We are your complete source for design, digital printing, direct mail, promotional products, banners, posters and much more all right here in South Charleston, WV. Minuteman Press is conveniently located on D street in South Charleston. Minuteman Press serves the entire business community of Kanawha county, including Charleston, Dunbar, Cross Lanes, St. Albans and surrounding areas with quality printed products, fast turnaround times and competitive pricing. You can rely on Minuteman Press with designing and producing your business and personal printing needs including postcards, brochures, newsletters, envelopes, flyers, stationery, business cards, business forms, promotional products, banners, signs and so much more. Our local clients include doctors, manufacturers, realtors, restaurants, schools & training facilities, management companies, churches, and many other businesses. Our professional design team is here to guide you from concept to completion. Our team has years of experience in branding, graphic design, marketing, communications, print, social and traditional media. We provide our business clients and retail customers with fast reliable service, result oriented solutions and quality products at affordable prices with quick turn-around times. 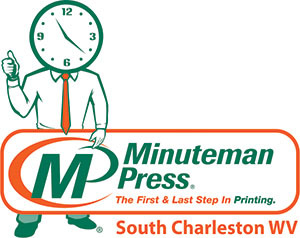 Minuteman Press South Charleston is a family-owned and run business. We understand how busy our clients are with running their organizations, so Minuteman Press offers free delivery within the South Charleston area. We invite you to visit us at our store; 503 D Street, South Charleston, WV 25303.